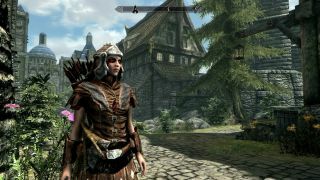 We've already covered just about everything you'd ever want to know about Skyrim Special Edition, Bethesda's massive open-world RPG that's now been adapted for Skyrim Nintendo Switch, but despite telling you how to find your footing, how to get all of Skyrim's followers, and where to locate Skyrim's word walls, we keep hearing the same question: how do you get married in Skyrim? Head to the settlement of Riften, and enter the Temple of Mara. Speak to the priest and ask about weddings, to receive information about how the process works. Purchase an amulet of Mara, then wear it when speaking to your potentially betrothed. If they agree to marry, return to the Temple of Mara to request the ceremony then wait 24 hours. Once the service is complete, speak to your partner to decide where you will settle down and make your home. You can check out our follower's guide to find out exactly who you can or can't marry, because, just like the real world, you can't always get what you want. Sometimes you'll have your heart set on a girl or guy only to find out that they're taken. Or, you know, they'll be eaten by a dragon. Just as likely in Skyrim.